The second version in the series this Siberian Storm Dual Play slot game is a really good follow-up to the original. As the name suggests, there are two slots in one, but it doesn't end there, because both of them are joined with a single enormous reel (the middle reel) which gives a huge number of extra lines. In total, there are 2880 pay-lines on this game. Of course, the increased fun comes at a price, in that it costs a lot per spin to get the same rewards as you would if you were playing the original version of Siberian Storm. Our free version (below) has all of the same features as the one in Vegas and should be identical in just about every way possible, because it is made by the same company (IGT). Play here with no download and no registration required. 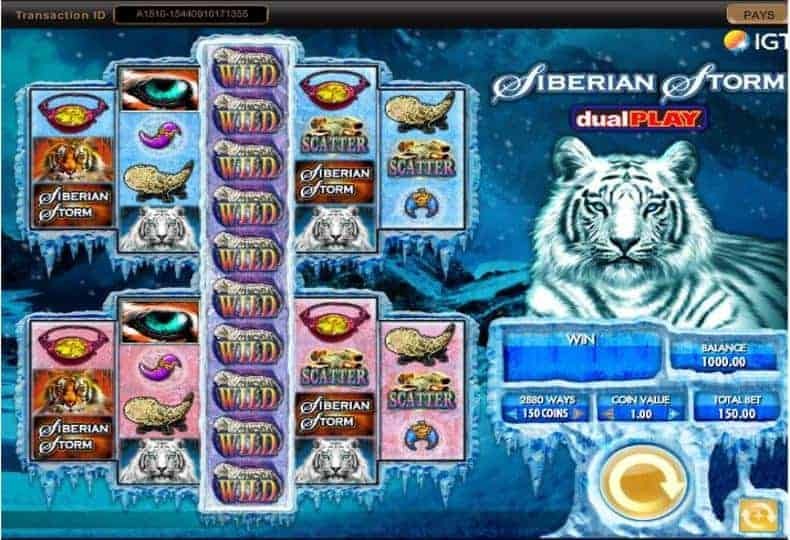 Siberian Storm Dual Play is a 1,440 or 2,880-ways-to-win slot machine from IGT. Themed around the freezing Russian forests, the release has a chilly feel to it, with the ice-capped tundra serving as a backdrop to the reels, which are protected by a royal white tiger. The reels are populated by mainly theme-related icons, including Siberian tigers, acting as Wilds, the game's logo symbols, the eye of the tiger, as well as blue, green, and purple horns. The main features of the Siberian Storm Dual play are the Free Spins feature, awarding up to 480 free games, Dual Play MultiWay Xtra engine, and Scatter wins that can potentially grant up to 3750x the bet, for five of them anywhere in view. As the name of the game suggests, players are presented with an option to play with two different slot machines here. So, if you opt for the top video slot only, you will have 1,440 ways to win, whereas, if you choose to double your bet, you will activate the bottom reel set, and get 2,880 ways to win. The two games are connected by the centre reel, which can expand up to 10 symbols high. Whenever five tiger eye symbols land in any position on successive reels, you will trigger the Free Spins feature, awarding eight free spins. Each different winning combination of five Scatters on the triggering spin will give you additional eight free games. It's important to note that the Bonus feature is played on a special reel set, with extra Wild symbols added during the free spins, to improve your winning potential. The round can also be re-triggered, so the maximum number of free goes can go up to a staggering 480 spins. The most you can make spinning the reels of Siberian Storm Dual Play is 3,750 your stake, that can be won with the help of multiplying Scatters during the free spins. If you play out of Australia or New Zealand, it's quite likely that you will find the release under the pokies section, whereas the UK, IGT-powered casinos will probably place it along with other favourite fruit machines.